The significant gradual growth in the paper and textile enterprises and the rising utilization of comfort food are creating an exceedingly fruitful grounds for the development in corn starch sales over the globe, especially in the region of Asia Pacific. Customers of corn starch are searching for choices to unadulterated sweetener that even after being less expensive fit flawlessly into different applications. This has been converting into increased demand for corn starch. The key market players that are working in the starch market are concentrating on item advancement and are including in different mergers and acquisitions to grow their global presence. Some of the major players leading the market are Global Bio-chem Technology Group Company Limited, AGRANA – Beteiligungs AG, Cargill Incorporated, Tereos Syral S.A.S, Roquette Frères S.A., Kent Corporation – Grain Processing Corporation, Ingredion Incorporated, Associated British Foods plc, Archer Daniels Midland Company, and Tate and Lyle PLC. Corn starch market is prognosticated to expand at a decent CAGR of 4.8% within the forecast period from 2016 to 2024. In 2016, the market for corn starch was valued around a worth of US$ 22.1 bn. On the basis of product type, the market is divided into native starch, modified starch, and sweeteners. Among these, the segment of sweeteners as of now leads with a share over 50% in the global corn starch market. 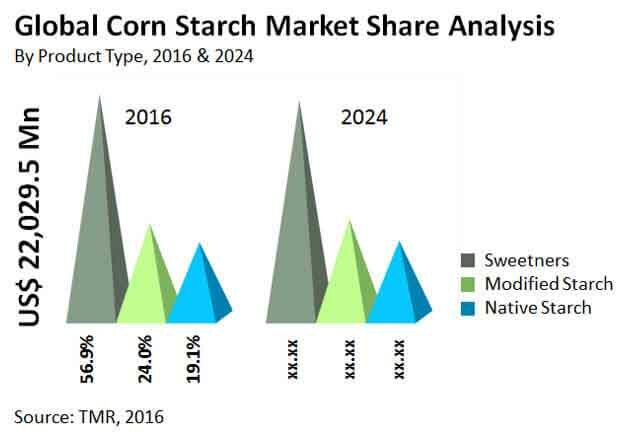 Corn starch market size is likely to witness a significant development in the forecast period. After cellulose, corn starch is the most used carbohydrate in the nature. Surging demand of the positive qualities in packaging and other food sector parts is propelling growth in corn starch market. It is utilized in every day human eating routine and also it is utilized as a stabilizer and a thickening agent. Demand for products has risen with its use in the production of biofuels. The development in ethanol industry has risen as a key factor for development of the market. The item is being changed into ethanol for a long time and is been utilized for making great biofuel feedstock. Supply chain network of corn starch market starts from farming fields. Corn and wheat are significant source for the item. Raw material is prepared in the manufacturing plants. In the wake of packaging it is transported to a grain storeroom available to be delivered. The product is very transient in nature so it is transported in a temperature controlled holder. It ranges to the makers and is utilized in various application. It is made accessible in supermarket, bazaars and others for utilization. Other products including custard, wheat, and arrowroot are playing as an obstruction in the development of demand for the product. The product needs nourishment and just includes calories in the eating regimen. Surging demand of the positive qualities in packaging and other food sector parts is propelling growth in corn starch market. Demand for products has risen with its use in the production of biofuels.